I'm finally getting around to writing up my list for this quarter. The Finish-a-Long changes hosts at the beginning of each year, so it has now moved to On the Windy Side, with Adrianne. Do you join in with the Finish-a-Long? I find it's a great way to keep track of the things I hope to finish, but I'm always thankful there are no punishments for not finishing stuff :) I like to dream big, and then I usually get distracted by new projects. 1. 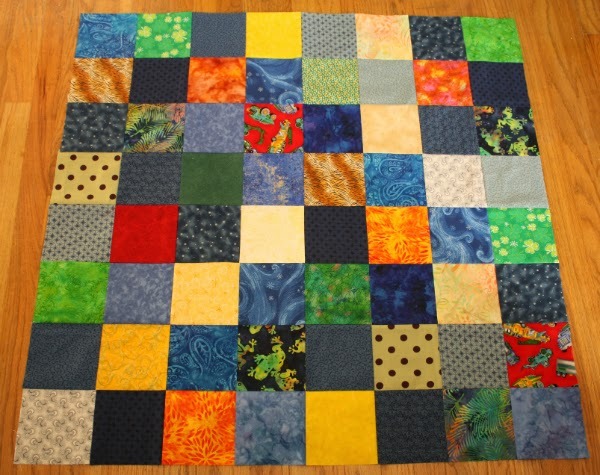 Eli's baby quilt. It's basted and I started quilting it last night. Hopefully it will be done before the end of the week. 2. A wedding quilt for Paul's nephew, Jordan, and his bride-to-be, Karen. I'm planning a throw size Irish chain quilt, which is a pattern I've always loved but never made. There is a rather tight timeline for this one...the wedding is February 7th and I haven't started yet. Uh, yeah...I have a feeling I'll be gifting a partially finished quilt and then bringing it home with me again. Really, I'm hoping to have the quilt top finished by the wedding date and anything beyond that is gravy. Then I'll finish the rest of the work as quickly as I can and get it to them. 3. My Craft it Forward #2. This one is about half finished. I just need to get the rest done and get it mailed! 4. My Craft it Forward #3. Haven't even started this one yet...it will soon be a year since I received my gift, so this needs to be crossed off my list. I'm stopping myself there. I have one secret sewing project that has to be finished this quarter, but I won't be able to share it until May and with the wedding quilt in there I think 4 items is plenty ambitious enough.